1. This document outlines DJ’s Landscape Management, Inc.’s. Standard Terms and Conditions (“Terms”). All services performed by DJ’s are subject to these Terms unless otherwise noted in the proposal. Customer’s written initiation of the services detailed in a proposal shall constitute a binding agreement (“Contract”) between DJ’s and the Customer, subject to these Terms. These Terms supersede all previous oral and written agreements made before the date of the Contract as well as any conflicting Customer provided terms. It is the Customer’s responsibility to review these Terms. All desired addendum / change orders must be made in writing and signed by both parties to be enforceable. 2. “Landscape Management” and “Snow & Ice Management” seasons are presumed to cover the time periods April 15 through November 30, and November 15 through April 14, respectively. 3. Unless otherwise specified or requested, DJ’s will invoice Customer near the fifteenth (15th) and thirtieth (30th) of each month. The first invoice will include the monthly installment and any additional services rendered through the date of invoice. The second invoice is only generated if additional services are rendered after the first invoice of the month. Customer agrees to pay 1.5% finance charge (18% APR) on accounts past the due date each month until the balance is paid in full. Charges for work completed outside the current invoicing period are still valid in their full amount. 4. Customer understands and agrees that delays in payments made to DJ’s may result in suspension of services, and appropriate legal action being taken to collect monies owed to DJ’s. Customer agrees that costs of such legal action, including without limitation, lawyer’s fees, costs, and expenses of suit or collection, will be Customer’s obligation to pay when DJ’s is the prevailing party in any litigation. Any checks that are returned to DJ’s for insufficient funds will be accessed an additional $25.00 service fee. This service fee will be added to the Customer’s account balance and become due immediately. 5. All work will be completed to the specifications outlined in the proposal and these Terms. Additional specifications such as call or check-ins requirements, service logging/reporting, specialized invoicing, or any other special consideration which causes DJ’s to incur additional cost may be subject to a proposal revision or additional fee. 6. In the event Customer is not satisfied with workmanship or quality, DJ’s will investigate and remedy the concern if the work has not been completed to the specifications of this agreement. If the specifications of the Contract are not directly applicable to a disagreement, the industry standard, as determined by DJ’s from its experience with other Customers, will dictate whether the work is satisfactory. stated. Private lines, such as irrigation, drain tile, and other non-public utilities, are not included in this service but can be staked for an additional fee. Customer understands that there may be unforeseen, additional costs associated with project work. be liable for any damages unless given opportunity to investigate and repair. The quality of repairs is to be governed by industry standards as stated above. material. An additional labor charge for green material removal and reinstallation will apply. Timing of replacement may, at DJ’s discretion, be predicated upon seasonal availability and weather conditions. invoice. Payment in full for all installments and/or services performed to date of termination and any applicable termination fee shall become due in fifteen (15) days. 11. DJ’s reserves the right to terminate the Contract without notice in the event of Customer’s failure to make timely payments, and/or actions by Customer to circumvent, interrupt or otherwise adversely impact, any relationship between a subcontractor and DJ’s. In addition, abusive or threatening behavior towards DJ’s will not be tolerated and will be grounds for immediate Contract termination and the imposition by DJ’s of the termination fee described in paragraph 10 above. 12. DJ’s Landscape Management, Inc. is licensed and insured. Proof of insurance is available upon request. 13. DJ’s Landscape Management office hours are Monday thru Friday, 8:00 AM to 5:00 PM. A 24-hour answering service may be utilized through the automated menu for emergencies. Hours of operation for Landscape Management Services are Monday thru Friday, 7:00 AM to 5:00 PM. Winter operation hours are 12:00 AM to 5:00 PM Monday thru Saturday and 12:00 AM to 7:00 AM on Sundays. Winter operational hours may vary with weather conditions. Work requests or special services which need to be completed outside of operational hours may be subject to an additional fee. 14. DJ’s reserves the right to add a fuel surcharge (not to exceed 3%) to hourly rates and monthly contract invoices should fuel prices exceed an average of $3.25 per gallon in any given calendar month as determined by http://www.eia.gov/dnav/pet/pet_pri_gnd_dcus_r20_m.htm. This surcharge is applicable regardless of Contract billing type. 15. A proposed price for snow plowing is for plowing of parking areas and/or driveways only. Unless specifically stated, sidewalk shoveling is not part of the proposed price. This service does not include salt spreading services or front-end loader service unless specified, however these services are available at an additional charge. For the purposes of these Terms, references to “snow clearing” or “clearing” shall refer to plowing and/or shoveling. 16. Customer agrees to allow DJ’s to decide if clearing is warranted based upon snow accumulations at the site where clearing is to take place. Customer waives any claim against DJ’s based on such decision and agrees to indemnify DJ’s for any claims brought against DJ’s by any third party based, directly or indirectly, on such decision, such indemnification to include payment to DJ’s of all attorney fees and other costs incurred in defense against such claims. DJ’s will exercise its best judgment based upon weather forecasts and existing conditions at the time. Customer is aware that weather may change rapidly and without notice. Changes in weather conditions are considered to be an “Act of God” for which DJ’s assumes no liability. 17. Unless otherwise specified, snow clearing services will be dispatched at one and one half (1.5) inches of new snow accumulation. Quoted rate is for clearing that is done as part of a regular service when all other accounts are being checked or cleared. Weather conditions permitting, snow services will be performed between the hours of 12:00 AM and 7:00 AM. Customer acknowledges the timeliness of services may be affected by late snowfall, wet/heavy snow, elevated accumulations, fast accumulating snowfall, equipment breakdowns, or other unforeseen and uncontrollable circumstances. DJ’s reserves the right to limit services during business hours due to the increased opportunity for accidents to occur. Customer is expected to have communicated daytime service requirements to DJ’s prior to proposal generation and signing. 18. Additional clearing services such as clearing an area where cars were parked when original clearing occurred, clearing areas where ice and snow pack has loosened to slush, clearing areas which have snow accumulation due to drifting, and any other reason other than new snow accumulation of one and one half (1.5) inches will be subject to a minimum charge determined by DJ’s. This is due to the fact that DJ’s operators are paid a two (2) hour minimum when called out for special clearings. Upon request, DJ’s can add these services to the Contract for an additional fee. 19. DJ’s reserves the right to make only one visit per 24 hours. In the event of significant snowfall over a prolonged period of time, return visits may be made only after all properties serviced by DJ’s have been cleared at least once. Should snowfall exceed six (6) inches of new accumulation during a 24-hour period, plowing and shoveling services may be billed on a time and material basis as larger equipment and/or additional time will be needed to properly clear the snow. This may also apply to situations where less than six (6) inches of new accumulation occurs, but due to drifting snow or layout of area, equipment other than the standard plowing equipment factored for the Contract, becomes required to safely and effectively clear the contracted area. 20. Customer is presumed to know the property boundaries. DJ’s will clearly stake the areas to be plowed as needed. In the event the areas staked are erroneous, it is the responsibility of the Customer to inform DJ’s of any errors. Should Customer fail to inform DJ’s or give reasonable notice in the event that an error needs correcting, Customer agrees to defend and hold harmless DJ’s for any and all trespasses or damage that may result. 21. DJ’s will clear snow from surfaces only in areas where it is deemed safe. To avoid damage, there will always be a small strip of snow along garage doors and other objects/buildings that will not be plowed. In the event DJ’s is unable to clear the entire contracted area due to obstacles outside of DJ’s control, such as parking spot(s) between two (2) parked cars, or the open half of a 2-stall driveway with a vehicle parked in it, only areas accessible and safe will be cleared. DJ’s does not prorate services in this instance. 22. It is presumed the Customer understands that snow plowing, by its very nature, involves pushing a steel blade over the surface of the pavement. If the pavement is defective, deteriorated, weakened, frost heaved, or was installed improperly, the results of these previous conditions are more likely to appear after snow plowing. Customer is responsible for all damages to or resulting from objects hidden in the snow such as but not limited to; speed bumps, manhole covers, or truck chocks. 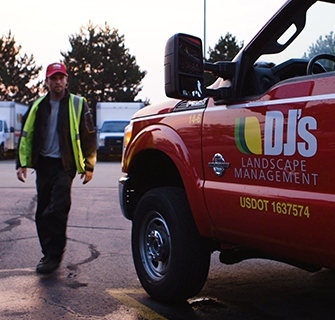 In addition to the general scraping damages which are expected from normal plowing, DJ’s accepts no liability for any damages occurring as a result of plowing asphalt before the final coat. DJ’s. Additionally, DJ’s operators are only authorized to operate equipment on paved surfaces. Customer will be responsible for all landscape repair costs resulting from instructing/requesting DJ’s operators to leave the paved surface to store snow, or for any other purpose. 24. DJ’s does not accept responsibility for property damages resulting from the weight of snow and ice. This includes snow and ice plowed / moved by DJ’s in the normal course of fulfilling a Contract or completing additional services requested by the Customer. DJ’s will only accept responsibility for damaged property when there is clear visual evidence an impact between DJ’s equipment and the damaged object has occurred. In some cases, it may be necessary for DJ’s to reenact the suspected incident, with the corresponding equipment, to determine the validity of a claim. Please reference paragraph 8. for additional stipulations. 25. Customer understands that sidewalk crews may not work safely if temperature and wind conditions combine to make wind chill factors below zero (0) degrees Fahrenheit. Customer agrees and understands that DJ’s reserves the right to stop working in these severe conditions (without penalty) so as not to force unsafe conditions upon employees. 26. Customer understands that clearing and/or salting of a particular location may not clear to “bare pavement” and slippery conditions may continue to prevail even after clearing or salt application. Unless otherwise stated, it shall be the responsibility of the Customer to notify DJ’s in the event that weather conditions cause melting and re-freezing of any previously treated surface area. Customer understands that DJ’s assumes no liability for this naturally occurring condition and agrees to release DJ’s from liability therefore and to defend and hold harmless and indemnify DJ’s, its owners, employees, officials, successors, assigns, and contractors, from and against all claims that may arise as a result of or are in any way related to this naturally occurring condition. 27. Unless otherwise specified, DJ’s will make one (1) visit after the end of the “Snow & Ice Management” season to remove plow stakes and repair landscaping damage resulting from snow clearing. Customer understands that lawn and landscape areas which are damaged will take time to return to their original state and this condition is a normal and expected consequence of snow plowing. Lawn areas will be repaired with top soil, grass seed, and beneficial penn mulch. Existing sod pieces will be used to aid in repair but at no point will DJ’s furnish new sod to repair damages. DJ’s is not responsible for damage to landscaping caused by salt residue run-off, salt overspreading, or soil contamination as the frequency of the salting applications is directed by Customer. DJ’s is not responsible for gravel, sand, dirt, or other deposits remaining in a snow storage area after snow has melted. If damage is extreme and the result of Customer instructions, it will be the responsibility of the Customer to pay for the necessary repairs. 28. If requested, specialty equipment and hauling trucks are available upon request. Equipment is priced per hour with a minimum of two (2) hour charge. When completing these specialty services, DJ’s cannot and will not accept responsibility for objects in the snow or for any damages to the customer’s property resulting from the work customer has requested DJ’s complete. This is due to the work regularly requiring large equipment and significant force in order to accomplish the customer’s objective. 29. DJ’s reserves the right to add a salt surcharge for contracted salting services when there are significant changes in product availability and regional pricing. This surcharge is applicable regardless of Contract billing type. The above prices, specifications and conditions are satisfactory and are hereby accepted. DJ’s is authorized to do the work as specified and payment will be made as outlined above. This contact will become valid forty-eight (48) hours upon receipt. Both signees warrant they have full legal right to authorize the work as described above. Agreement is binding between DJ’s and Authorized Agent and is subject to DJ’s Landscape Management Inc.’s Standard Terms and Conditions located at www.djslandscape.com/terms-and-conditions. Click here to print our Terms & Conditions.